While perusing apartments on Craig’s List, I came across a listing from Rapid Realty. It looked intriguing to me because it appeared the agents help renters find housing. I went to their website and poked around and decided we should at least go by their office and talk to someone. The agents there deal solely with rentals in Brooklyn, so they know all about the area and they have relationships with all kinds of landlords. They had some suggested documentation that potential clients should have on hand, so I printed out a bunch of stuff before we left Amarillo. We arrived at the office, told the woman at the front desk who we were and what we wanted. She introduced us to Cal. Cal is now our agent. He showed us three apartments that day, one of which we liked. We filled out a bunch of paperwork and handed over all the financial documents I brought for us and there you go. We left after being told we might have a meeting with the landlord the next day. 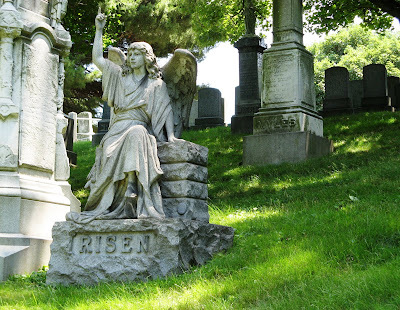 We felt like we had accomplished something, so we took a walk around our possible new neighborhood…up the hill to Green-Wood Cemetery, then over to Prospect Park. We took the train back to Coney Island, walked around, walked down to the water. They have the hugest, most ginormous seagulls ever at Coney Island! I swear, they are probably two feet tall and FAT. You can walk right up to them; I’m sure they’re sure you’re going to feed them. Blech. Gross birds. I can’t decide what’s grosser, though: seagulls or pigeons. When we got really really tired, we took the train back to Bensonhurst, grabbed some McD’s and went back to Tom’s. We ate and watched him clean out the cabinet under his kitchen sink. As we prepare to move to NY, he’s preparing to move away. [sniff] Tom is an old old old friend of mine from college. He is very generous and very funny.